The posterbox is a trusted promotional tool of any cinema. 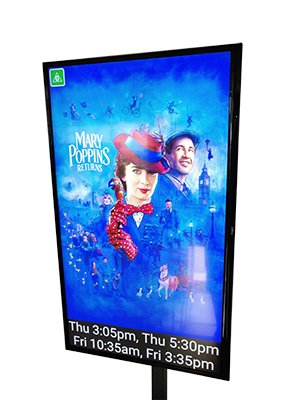 Large screens showing upcoming and current movies on offer are an essential promotion tool of all cinemas. However, they take a lot of labour to upkeep, costs in shipments and generate a lot of waist. AutoPoster will not only replace these tasks and costs but build on them by also showing relevant data such as session start times or location opening dates. This service is currently in use in pilot sites and will be made available to a wider community for testing in the near future. What is required? Currently the missing piece that needs to be developed is a way to source your locations schedule into the D-Cine.net back end services. This will be looked into over the coming months as to form the best path for locations to push this data into the service backend as so it can automatically show posters suitable for your cinema. Those interested should contact D-Cine.net. We would like to know more about what POS or other services you may already utilise in terms of feeding your session data.